I live on the East side of HuayKaew Residence. 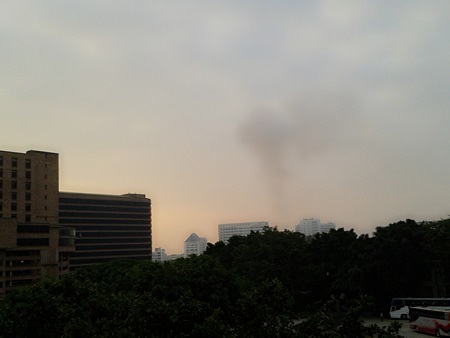 Each morning there is much pollution going into the air from the Suan Dok Hospital. I took the photos from my room. Thank you for updating the nationwide accident statistics online on Facebook. However, I have to wonder how accurate they are. I heard a rumour that they only counted those people who had died at the scene as fatalities and those who died later at the hospital were not included in the death count. I do not know if this is true but if it is then that would mean the numbers are surely measurably higher than the “official ones” given out by the government. If it is true it would seem to be a method of “fudging” the number so they do not seem as awful as they truly are. I understand that the numbers have nearly halved from ten years ago but it is still an appalling number and one that could easily be avoided if the police were to actually police; that is set up roadside checks and breathalyse anyone who drives through after around 1 a.m. Arrest them and put them in the drunk tank. Fine them some enormous amount and then people might start reconsidering drink driving. But I did not see one police check in the days leading up to New Year’s Eve. I stayed in my moobahn that evening and celebrated the night with my friends and neighbors and then we all sensibly stumbled home again. Not a single death occurred in my moobahn since everyone was at the local party. I cannot really understand why this remains such a challenge for Thailand. The solution is really quite simple but it does require that the police stay out all night and check people. Perhaps they are too cold or prefer to enjoy their own New Year’s Eve which is a pity, because certainly many lives could be saved if they stayed at their posts.